IMPROVED, UPDATED, AND FIXED: Hundreds of corrections and improvements made across all shipped Standard Sets. NEW: Sort option for references to book chapters, online sources, and theses. IMPROVED: Sort reference details in any sequence. IMPROVED: Document example now includes reference citations. IMPROVED: Standard Set Generator no longer needs to use custom properties, making it vastly simpler to use. IMPROVED: You no longer need to tell Merops to use specific language dictionaries for recognition, it will auto-detect the language of your document. FIXED: In the Standard Set Editor, clicking Tidy up on the Custom Properties page would move BODY OF DOCUMENT to the bottom of the sort sequence on the Front and end section page. FIXED: In the Standard Set Editor, creating a new Standard Set based on MLA Style Guide was in fact creating one based on Oxford Style Manual. FIXED: Using Look Up when the cursor is in a footnote or endnote, caused an infinite loop error loop. 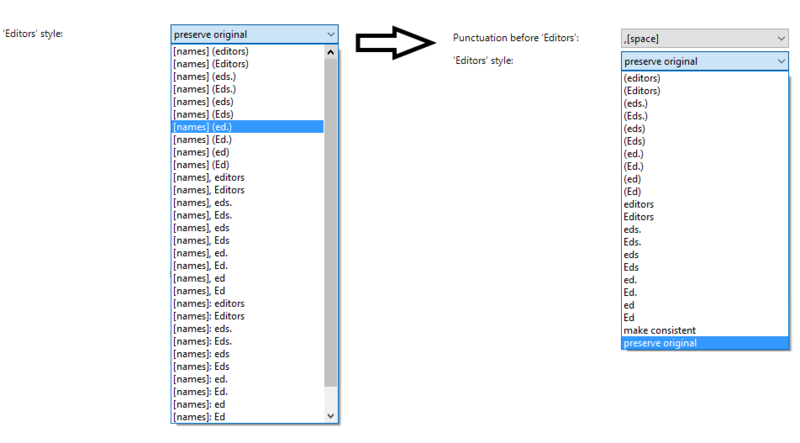 FIXED: A number of corrections have been made to the Styles Plus menu. If you right-click on the menu and click Restore default styles then you’ll load the correct list, but any customizations you’ve made will be lost. 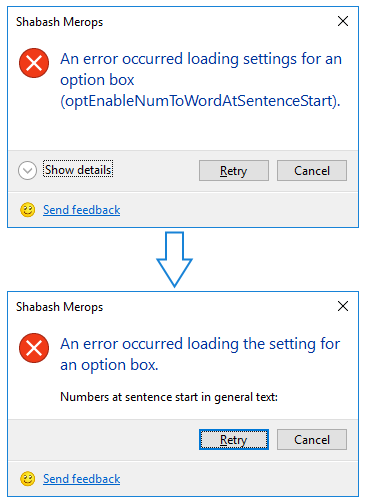 FIXED: Show Default Word Menu on right-click menu in Word did not do anything. IMPROVED: Document Standard Set button now truncates long Standard Set names. IMPROVED: Transport module renamed: Engineering. IMPROVED: Input word count counts equations as 1 word, rather than 0. IMPROVED: Error message calculating word/equation count now has an Ignore button. IMPROVED: Standard Set Generator has better error handling. IMPROVED: Microsoft Compatibility pack error message showing download URL now has a clickable hyperlink. UPDATED: Chambers Lookup path updated. UPDATED: CrossRef name updated to Crossref. UPDATED: New logos for Crossref and WorldCat on user interface. FIXED: You can now use Look Up on words inside deleted text. FIXED: All developer-only messages now make it clearer that it's a developer-only message. FIXED: Error in status for Process selection saying that the output file was being opened to convert its format. FIXED: Error messages no longer say "(line 0)" at the end. FIXED: Input word count was not counting footnotes or endnotes. FIXED: Input word count was only being displayed during processing if the document contained equations that needed to be converted to MathML. FIXED: Input word count was wrong if a document contained multiple equations. FIXED: Options: Server path option box was sometimes too narrow. FIXED: Process selection was sometimes unable to insert the output into the document. FIXED: Spelling error in message box: "Rename output filess"
FIXED: Standard Set Generator was by default suggesting the Standard Set be given the same name as the input file. FIXED: On process recovery dialog, Clear and Cancel Queue button is now in sentence case. GenBank number intro: GenBank accession No. | GenBank No. | accession No. Reference list: Edition style: (2nd ed.) | (2nd Ed.) | (2nd edn) | (2nd Edn.) | (ed. 2) | (Ed. 2) | (edn. 2) | (Edn. 2) | (second ed) | (Second Ed) | (second ed.) | (Second Ed.) | (second edn) | (Second Edn) | (second edn.) | (Second Edn.) | [2nd ed.] | [2nd Ed.] | [2nd ed] | [2nd Ed] | [2nd edition] | [2nd Edition] | [2nd Edn.] | [2nd edn] | [2nd Edn] | [2nd. edn] | [ed 2] | [Ed 2] | [ed. 2] | [Ed. 2] | [edn 2] | [Edn 2] | [edn. 2] | [Edn. 2] | [second ed.] | [Second Ed.] | [second ed] | [Second Ed] | [second edition] | [Second Edition] | [second edn.] | [Second Edn.] | [second edn] | [Second Edn] | 2nd ed. | 2nd Ed. | 2nd edn. | 2nd Edn. | ed. 2 | Ed. 2 | edn. 2 | Edn. 2 | second ed | Second Ed | second ed. | Second Ed. | second edn | Second Edn | second edn. | Second Edn. IMPROVED ERROR HANDLING: Copy setting to… feature has better error handling. IMPROVED: Add a comment to the top of every document box has scroll bars. IMPROVED: Add a comment to the top of every document box is 50% larger. IMPROVED: Add a comment to the top of every document box supports Ctrl + A to select all. IMPROVED: Added OSCOLA and AMA to the Standard Set templates list. IMPROVED: Heading format setting is now disabled if [no heading] is selected, for phone and email in correspondence info. IMPROVED: Clicking Browse from the file menu no longer closes backstage tab until you choose a file. IMPROVED: Refs Lists General: Other discrepancies: now has a more intuitive description when printing etc. UPDATED: MLA Manual of Style Standard Set renamed to: MLA Handbook. SIMPLIFIED: Removed setting to enable/disable recognizing run-in headings. Merops will always match run-in headings consistently. SIMPLIFIED: Removed setting to not look for acknowledgements. Merops will always match acknowledgements consistently. SIMPLIFIED: Removed setting to not look for headings without character styles. Merops will always match headings consistently. SIMPLIFIED: Removed settings to enable/disable matching of actors' names, directors, TV channels, movies, and TV programs - Merops will now always match these consistently regardless of Standard Set. SIMPLIFIED: 'Telephone' style: label changed to Heading:, and the same for fax and email. FIXED: The setting Number/sort numeric references by: wasn’t being disabled when Reference type: ‘name/date style’ was chosen. FIXED: Bracket style: = 'parentheses' or 'brackets' was a confusing setting. Now says '(parentheses)' or '[square brackets]'. FIXED: Comments could be hidden behind other controls after opening a Standard Set. FIXED: Custom properties: Add… dialog, when resized, was not resizing the textboxes. FIXED: Custom properties: Adding a property wasn't being added to the undo buffer correctly. FIXED: Custom properties: When you click Tidy up, it no longer says "No settings could be tidied up" if you don't actually have any custom properties. FIXED: Merops wasn’t correctly clearing found listview items in found results. 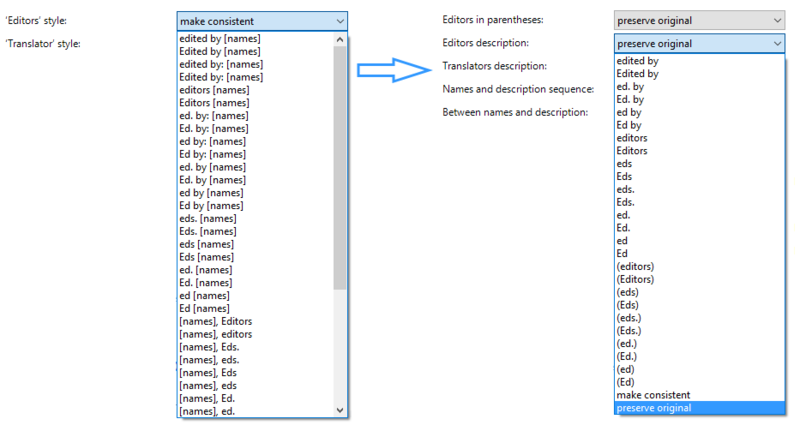 FIXED: Delete button on Custom Terms wrongly launched Edit dialog. 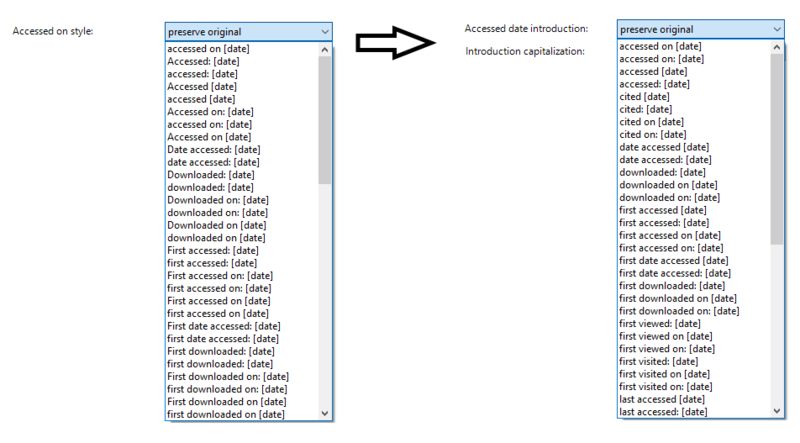 FIXED: Document example didn't always show a deleted article title in journal reference. FIXED: Document example didn't always show correct spacing between a full given name and the middle initial. FIXED: Document example didn't always show correct spacing/punctuation of author initials in a reference. FIXED: Document example could sometimes show the whole keywords paragraph as italic. FIXED: Document Example showed the wrong punctuation sometimes before email address in correspondence. FIXED: Document example showed extra punctuation when ‘In’ should not be included in chapter examples. FIXED: Document example wasn't correctly showing the table caption as "Tab" or "tab"
FIXED: Document Example: 2 different references had the same WorldCat ID. FIXED: Document example: Now lists references in alphabetical order. FIXED: Find Next would not remove highlight from the last found item if you had clicked on a different control. FIXED: Find would continue from the last found location, even if you'd clicked on a different control. FIXED: The options available for Law report format in footnotes and references and Legal case standard were completely wrong. FIXED: If a drop-down box was changed using up/down key on keyboard, the Save button did not become enabled and the document example did not refresh. FIXED: If you set Accessed on style to 'Accessed [date]' it would wrongly save it as "Accessed: [date]". FIXED: Label error: "1 names plus 'et al.'" FIXED: Label error: 'Before Date (book etc):' was missing a point after "etc" (Shabash House Style). FIXED: Label error: 'Before Date (book etc):' wrongly had a capital D.
FIXED: Label error: Corrected 'Table head case' to 'Column head case'. FIXED: Label error: 'Expand abbreviated years…' now uses correct apostrophe character. FIXED: Label error: Missing closing parenthesis in heading: "Type descriptors (e.g. ‘Figure’ or ‘Paragraph’"
FIXED: Label error: Missing 'to': "apostrophes should not be used abbreviate missing years"
FIXED: Label error: Point in wrong position in label "names plus 'et al'." FIXED: Loading all spellings for Merriam Webster dictionary was not loading the correct spelling of "zoological". FIXED: New settings: Clicking Unset rules > Load unset rules from another Standard Set then clicking Cancel caused an unhandled error. FIXED: New settings: Loading them from another Standard Set was not working for checkboxes, in fact it only loaded EXISTING settings. FIXED: Some option boxes were not wide enough to fit all available options. FIXED: 'physiologic' was wrongly listed as the top option in spelling, meaning it was wrongly selected when loading settings for the Oxford English Dictionary. FIXED: psychologic/al setting was applying the opposite to what it said. FIXED: Punctuation between affiliations showed a [space], even though there is a separate rule. FIXED: Saving the wrong value for tableCellStartTab when set to preserve original, which could cause it to make changes in the document. FIXED: Some headings showed a hand cursor when you hovered the mouse over them. FIXED: Table glossary heading now says 'Glossary[space]' and applies the correct setting value. FIXED: The setting for 'Notes heading' was applying changes even when set to 'preserve original'. FIXED: Tooltip error: "a accent". FIXED: Tooltip error: "Here you can set the the punctuation…"
FIXED: Tooltip error: Removed wrong 'Table head case' tooltip from 'Left-hand column subhead indent' setting. FIXED: Tooltips error: Some tooltips were not showing the full message. FIXED: Top choice for page break before heading 1, and brackets around heading numbers both set correctly. FIXED: When a new Standard Set was created from scratch, Merops would not automatically turn on the Abbreviations module. FIXED: Would not save the enabling of the Non-English module correctly, instead it would save whatever the Abbreviations module was set to.